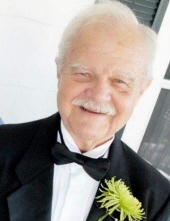 Jerry Cecil Brown passed away on Wednesday, March 27th in his home in Historic Norcross surrounded by family. He leaves behind his adored wife of 33 years, Susan, his daughter, Katie Kirillov (spouse- Alex), and step daughters Carol Diaz (spouse- Paul) and Frances Irwin. He also leaves behind grandchildren Alexis Chatham, Austin Irwin, Ethan Irwin, Natalee Diaz, and Mila Kirillov, as well as extended family. Born on August 21, 1938 in Macon, Georgia to Helen and Cecil Brown, Jerry was the oldest of four children- Janet James (deceased) (Richard James) of Alpharetta, Carole Harrison (John) of Atlanta, and Robert Brown (Beth) of Macon. Jerry spent much of his career working for the government including the IRS, Department of Defense, and retired from the Centers of Disease Control. Jerry's motto was "work hard and play harder". He never met a stranger and will be missed by many. He was an active member at Peachtree Corners Baptist Church and even taught Sunday School for several years. Jerry's faith was especially important to him, and we can rest easy knowing his soul is in Heaven. A memorial service will take place on Wednesday, April 3, 2019 at 2:00pm at the Peachtree Corners Chapel of Crowell Brothers Funeral Homes & Crematory. The family will receive friends that same day from 1:00 PM to 2:00 PM and on at the funeral home. In lieu of flowers, if able to, please donate blood to The American Red Cross or donate/volunteer at Habitat for Humanity. On-line condolences may be expressed at www.crowellbrothers.com. Arrangements entrusted to Crowell Brothers Funeral Homes & Crematory, 5051 Peachtree Industrial Boulevard, Peachtree Corners, GA 30092. 770-448-5757. To send flowers or a remembrance gift to the family of Jerry Cecil Brown, please visit our Tribute Store. "Email Address" would like to share the life celebration of Jerry Cecil Brown. Click on the "link" to go to share a favorite memory or leave a condolence message for the family.